Patty: Spiritual fruit is often hard to measure. Evangelists can count the number of hands that go up when an offer of salvation is made, but who is there to count the ones who continue with their walk of faith? And how does one measure the fruit of a pastor? Is it always counted by the number of congregants in his church? Is a pastor of a mega church more fruitful than a pastor of a smaller church? Or perhaps fruitfulness is measured by the fruit that remains, according to Scripture. Maybe fruitfulness also has to do with connecting, with heart relationships for kingdom purposes that last a lifetime, or making disciples that endure to the end, or healing the sick and setting the captives free, or is it just being faithful to what God has called you to do? Hopefully, Dan and I were faithful in the assignments God gave us and have made and strengthened lasting friendships, as well as further encouraging the leaders in our network. As a bonus, we were used to heal some sick and set some captives free! We definitely experienced his grace as we were involved in three very intense weeks of travel, ministering in Phoenix, AZ, to Pagosa Springs and Denver, CO, and then a week in Brazil. Our first stop was Phoenix where Dan and I ministered together with JB. 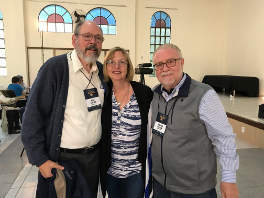 The three of us taught and equipped the attendees at the western Tikkun Leadership Institute in evangelism. The most memorable moment for me was at the end when we called forward those who sensed a calling for the specific ministry of an evangelist. About seven came forward. JB just happened to have with him a prayer shawl (tallit) that had belonged to Richard Wurmbrandt, a godly saint who was tortured in the former Soviet Union for his faith. We placed that prayer shawl over the shoulders of those who were being gripped with the suffering heart of God for the lost. What a powerfuldemonstration of the meaning of the fellowship of sharing in Yeshua’s suffering for the purpose of reconciling the people of the world to himself. 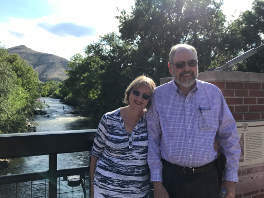 Next, we flew to Pagosa Springs, CO, to a moderate size church led by a pastor who has been deeply impacted by the Holy Spirit concerning Israel and the Jewish people. 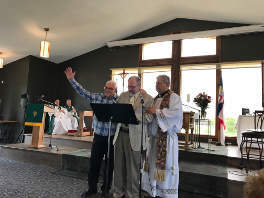 He is a choice servant of God and there was a sense that this church will be mightily used in the future concerning the saving of Jewish refugees who will be fleeing persecution. This church community is strategically located in the midst of a famous resort town where thousands of international tourists convene in order to make use of the healing hot springs located in this city. Dan had a timely message that further connected this church to God’s end time purposes for Israel and outlined the true identity of the church in the nations as being those who are grafted into Israel and are tied to her destiny. Then we flew to Denver where we ministered at Or Chaim and were blessed to see how this relatively new congregation was beginning to flourish. We were able to spend quality time with the leadership couple and strengthened our mutual commitment to each other and God’s kingdom purposes. On Sunday, we ministered for the first time in a Charismatic Anglican Church whose leader was also being impacted by the message of Israel. So, here again, we sensed some more divine appointments which will yield greater fruit in the future. We returned to our home base in Kansas for a couple of days and then flew to Sao Paulo, Brazil. 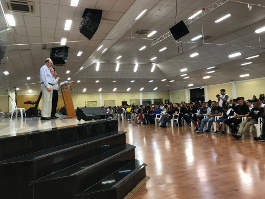 This was one of the greatest ministry ventures for me as I had a chance to preach to over 1,200 people on Saturday night and then speak at a Bible camp of a couple of hundred people the following week for five straight days. Each meeting I unpacked my life message, which was a message about choosing life. It has been years since I felt this kind of liberty preaching and during these times when I was speaking I felt new life flow through me and renewing my youth like the eagle. Many, even Dan, said that they were deeply moved by my messages. Each time I went up to speak I had only a few notes and then the Spirit began to pour his heart out for the people in passionate words not originating with me. I felt as though I was preaching these truths of life to myself! 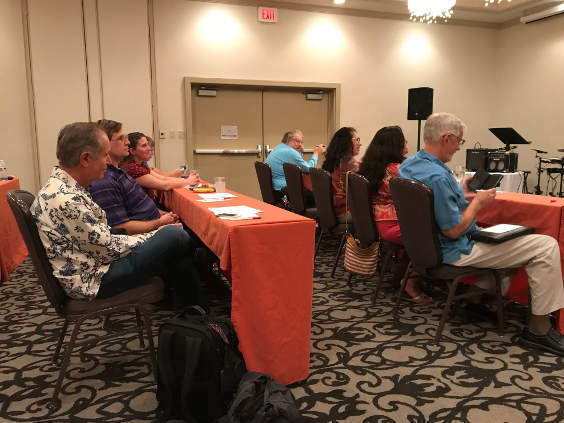 Dan was thrilled to be able to teach twice a day, in a systematic way, concerning many issues of church history, Messianic Judaism, and social justice. He taught for so many hours … and doing so without notes! He never fails to amaze me how he can remember a quote from so many scholars. Also, he was able to accurately teach on various theological traditions, arguments, etc. I think almost everyone was deeply moved. 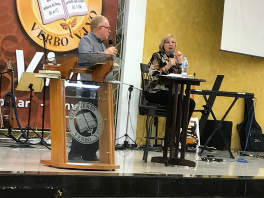 While in Brazil, we were able to strengthen our relationship with Harold Walker, an amazing apostle in Brazil who oversees several Bible schools. 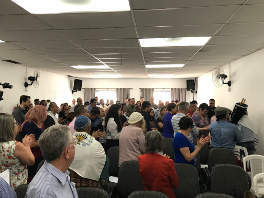 We were even able to reconnect to a Messianic Jewish congregation, one where we had spoken over twenty years ago. We immediately felt a melding of hearts and a sense that God was calling us to walk more closely together. Dan: Brothers and sisters, we are able to carry on our work in Israel and to other nations at little or no cost to them due to your support. We constantly mentor, teach, encourage, as actively as at any time in our lives. However, as some supporters are unable to do as much, we need new supporters. Whatever you can do to increase support is greatly appreciated. 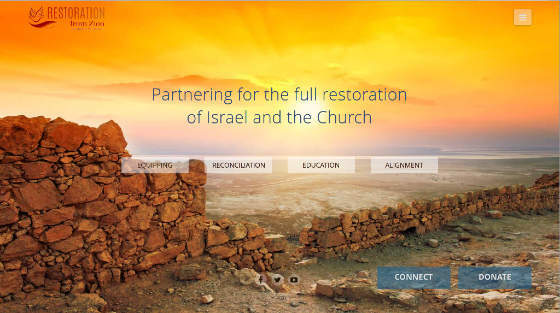 I hope in the next letter to outline a bit more of our work in Israel. We bless you all who have been praying for us! You are partners with us. It is with great sadness we report that the daughter of some dear friends, Rick and Patti Ridings (the leaders of the 24/7 prayer and worship center in Jerusalem, Succat Hallel) succumbed to the horrible disease of cancer after two years of intensely fighting for her life. Esther Ridings Moore will be remembered as an amazing songstress, having written many anointed worship songs. Her music has been sung all over the world for the past several years. But more important, she will be remembered for the great courage and sweetness she exhibited in the midst of great trials. 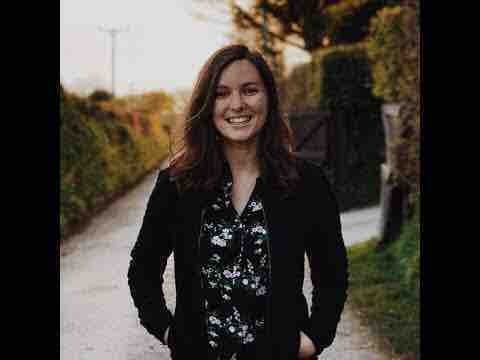 Her husband, Will, as well as Esther’s whole family, maintained a stance of faith and hope to the very end and declared that death had been swallowed up in victory. We all felt that our faith was strengthened in the midst of this epic battle. Esther had been receiving immunology treatment in Tijuana, Mexico, after the regular medical route failed. At the treatment center, she contacted sepsis and pneumonia and ended up in intensive care for over six weeks. During this time, a massive world-wide prayer vigil took place, the most extensive prayer initiative I have ever been part of. Making use of modern technology, the parents were able to develop a Whats App prayer group that received daily updates and notes of encouragement from hundreds, though thousands were praying. This battle for Esther’s life reminded us so much of that battle Dan and I fought (Rick and Patti were with us when this took place) when we had world-wide prayer for our son, Samuel, who died as a result of a house fire 20 years ago. Yet, despite the prayers of faithful warriors, he died after two days of being on life support. There are never any satisfying answers as to the question of “why?” And though God’s grace is sufficient, empowering us as believers to travel this road of sorrows, losing a loved one is an indescribable pain. We were never created to experience death, but thanks be to God, this great enemy has been defeated at the cross. And soon, in the age to come, there will be no more death or sorrow or tears. However, now we grieve as we wait for the time when our mourning will turn to joy. Copyright © 2017 Restoration From Zion, All rights reserved. Not receiving this monthly update? Subscribe here!